Today I am so excited to share with you an awesome little Etsy shop called All About The House. They have fun little things to help you organize like planners, recipe cards and binder covers! But wanna know the most amazing thing? They are all printable. So the owner, Rachel, (who is the sweetest thing and lives in Australia!!) sends you them via email and you are set to go! Yes, no waiting for weeks for them to arrive! She was so kind as to let me customize my own fancy little planner. It is a fairly new item she is promoting called the "Build-your own Printable Personalized Planner" and is literally the best thing ever. You can print out as many copies as you want (in case you are uber OCD about smearing black pen and messing up your to do list... yes I'm that girl) so it's like you really designed it for yourself! This shop is for you if you are an organization junkie like myself! Here is a page from mine. I absolutely love the layout and think it is perfect for summer when I don't have that much to accomplish. Plus, you can really make it your own! And... that's not even the best part ;) Rachael has generously offered to do a giveaway for one Printable Personalized Planner! The lucky reader gets to personalize it with their chosen colors, etc. This giveaway starts today, July 1 and ends a week from today, July 8! Such a great product! Would be so helpful to organize everything. 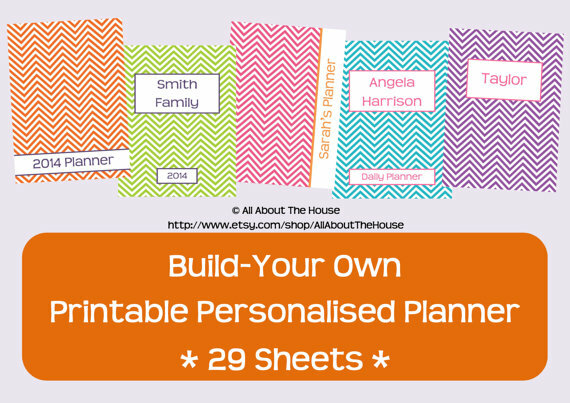 I like the build-your-own personalized planner! These are such a cute idea! An adorable and stylish way to keep you organize everything! Those printables are so cute and perfect for the organization addict! Those are super cute planners. Love the chevron style. I love the everything, but I like the planner and the calendar the most! I like everything, but mostly the planner and calender!! !